Ondine (shown) ~ "Cool and soothing, the essence of water. Essences of narcissus and myrrh and sweet kewda attar relax the senses and unlock memories of river, lake and pond." Rayon Vert ~ "Deep green moss, wet roots, dark licorice. Intricate mosaic of scents, evoking dark licorice and roots, moss and herbs, wet forest and rain-soaked meadows. Lush pink frangipani and a special blend of anise-hyssop, all in a swirl of emerald green." Ilari is an exotic blend of jasmine, sandalwood, musk, ebony wood and orange blossom, in an elusive union of soft and feminine with clean and herbal. Rayon Vert sounds quite delicious and unusual, so long as the pink frangipani isn’t too lush (or pink). Great price on the solid. 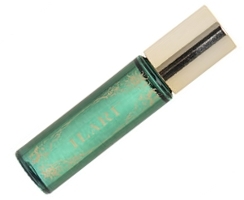 Ilari also intrigues me, but probably unlikely that I’ll get to smell it. My thoughts exactly. I can’t make up my mind about the pond water, though… Might be awful, might be fantastic; and now I’m having flashbacks to 5th grade science class, hiking down to the river to collect water samples for the microscope. What fun that was! Screw the perfume, I want to take a science class field trip now!! Me too. If money were no object, I’d love to work for the Science Museum of Minnesota. Alas, I have a family to support, and the wrong education to get anything but a grunt job there. Both of these sound good to me, but yes, Rayon Vert esp. hmmmm…cool soothing water…yup got that in my kitchen sink….if you want to be fancy; I’ve got the reverse osmosis thang right there too…. Rayon Vert sounds intriguing though. I never really thought about licorice (anise) in perfume before…but wet forest & roots , green moss sound good to me….cool, dark and earthy. I think the licorice might really add to that. Perhaps a sample order is in my future. They do sound worth trying! Hrm… 4 samples for $20. But yes, yes, Daisy, I’m sure a sample order is in your future, since I’m always worried that you might not have enough perfume around there. yeah, it’s awful….I’m only wading in the stuff rather than actually swimming….. Exactly why I might like it! A melon-free water might be fun. I agree!! It sounds worth trying. Thanks for looking up the ingredients. That llari roll on perfume is calling my name.